The course suitable for all creative industry practitioners – musicians, visual artists, performers, writers and filmmakers – both established, emerging and introductory level artists who are now considering making a more sustainable career from their chosen creative field. 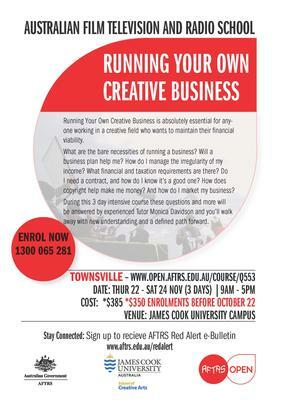 Rob, Armidale - A fantastic course! Not just inspiring, but totally practical as well. I’m currently happily working through the exercises in the workbook and finding them really relevant and useful. Dan, Melbourne - The course today was, quite simply awesome - empowering, enlightening and most importantly entertaining. Ben, Melbourne - It was great doing your course yesterday. Heaps of excellent information that I can use right now. Thanks! Joanne, Port Fairy - I'd like to thank you again for the information that you delivered to us in yesterday's workshop at Port Fairy. There was a tremendous amount of useful information in both the handout and the discussions and I feel both inspired and empowered to get stuck into sorting it all out. Radam, Hamilton - Thanks again for a great class in Hamilton, it was so insightful and inspirational. I've already started making moves to get my business up and running. Rosemary, Launceston - Many thanks for generously sharing your creative business ideas, resources and knowledge. I left your Launceston AFTRS workshop both inspired and in action. Jill, Hamilton - For the first time, after doing something of this sort, I am motivated to follow up on the "homework" in the workbook, because the book itself seems such a good resource and is less dry than the usual.